1 The cliff face overlooking the lake was riddled with caves. Large, seemingly featherless creatures dropped from those openings, spreading their wide leathery wings to catch the updrafts of air. 2 One red-gold adult stood in her cave opening. Behind her was a nest with a single leathery egg. Her mate had just returned from fishing in the lake and was settling down to warm the egg. 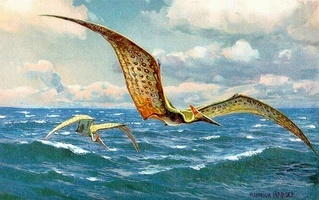 3 The pteranodon's head looked too large for her thin neck as she watched the soaring bodies that rose and fell in the air before her. There was a loose pattern to their flights as they got ready to claim their breakfasts from the water. 4 The slight breeze ruffled the hairy-looking feathers that covered her body, helping to hold in her body heat. Then without warning, she dropped out of the cave opening. For just a moment she plummeted toward the ground. Then she opened her wide wings. In seconds she went from an uncontrolled fall to flying like a skillfully controlled aircraft.